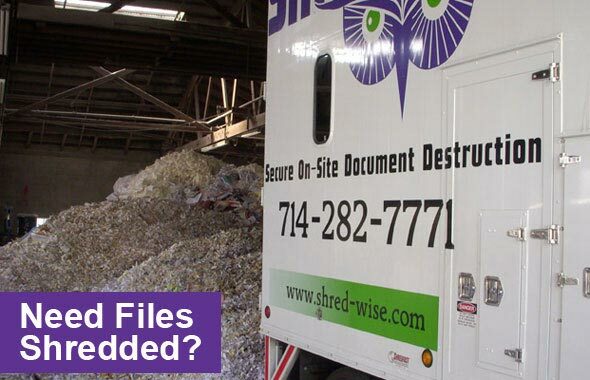 Request a pick up of their documents and have them shredded off site. Our flexible shredding services make it easy for us to accommodate last-minute requests of residential customers as well as the recurring shredding needs of commercial clients throughout Irvine. 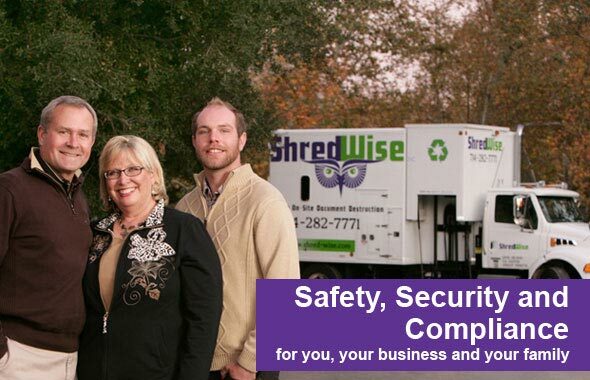 Shred Wise is a family-owned and -operated, locally based shredding company. Not only are we centrally located in Orange County, but we also keep the vast majority of our service routes in Orange County. By committing to the area directly around us, we are able to offer truly dedicated service to Irvine. Whereas some of our competitors are coming from Riverside, northern LA County, or further, Shred Wise shred trucks are always just around the corner, which means that we can add extra stops in Irvine on any given day. Moreover, we are completely invested in keeping our clients happy: we know them by name; respond to requests in a timely manner; offer them valuable advice related to information destruction; and don’t charge extra for requests we feel should simply come standard with good service. As a result, Shred Wise doesn’t depend on long-term or auto-renewing contracts like other shredding companies — our customers stay with us because they want to, not because they have to. If you are interested in getting a free quote for our shredding services in Irvine, call us today at (714) 282-7771. We are licensed, bonded, and insured, and NAID-compliant. We recycle 100% of the paper we shred, and ensure that our document destruction services are completely compliant with HIPAA, FACTA, Gramm-Leach-Bliley, and other privacy laws. We are available seven days a week for paper shredding at our facility, and provide mobile shredding services Monday through Friday, from 7am to 5:30pm. Convenient scheduling for mobile shredding services. Friendly, professional, and dedicated customer service. Cost-effective shredding solutions tailored to their needs. Staff that are knowledgeable in all aspects of information destruction. Shredding service that comply with all local and federal privacy laws. Secure shred bins and consoles to use with our services at no additional cost. Ability to witness their documents being shredded. Certificate of Destruction with every shredding job. 100% of all shredded paper to be recycled. Call us today to learn how we can meet your residential or commercial shredding needs in Irvine. Estimates are free. Just like any other efforts used to protect assets and/or sensitive information, individuals and businesses in Irvine should ensure that they aren’t cutting corners which could leave them vulnerable to data breaches, identity theft, or fraud. That’s why at Shred Wise we are always happy to help you understand the best practices for information destruction. This includes ensuring that you are shredding your documents properly and not forgetting to include any documents with private information. Personalized mail – credit card offers, benefit summaries, junk mail, and more. Of course, if anything has your social security number, date of birth, driver’s license information, and bank account information on it, it is always safest to shred it. Having been victims of identify fraud ourselves, we feel that you can never be too careful. To learn more, give us a call. We are happy to review with you what documents you should be shredding in Irvine. For those clients who work with or produce sensitive information on a regular basis, we usually recommend our on-site shredding (or mobile shredding) service, where we supply them with locked consoles and/or rolling bins and routinely empty and shred the collected paper curbside in our state-of-the-art shred truck. This option can also be surprisingly cost effective for those clients in Irvine who, every now and then, accrue small numbers of boxes of paper for shredding. Our mobile shredding service is often less expensive than bringing it to us and paying by the box. In addition to on-site shredding services, we also provide off-site shredding services. Those in Irvine can either bring a few boxes to our facility located at 3222 East Chapman Avenue in Orange, California, or have us send out our secure panel truck to pick up your locked containers and/or boxes of paper and files. In every scenario, we guarantee that your documents will be 100% destroyed and recycled, and provide you with a Certificate of Destruction at the end of each job. With our flexible and customizable shredding services in Irvine, you will be able to schedule service as little or as often as you need. We offer one-time visits for those who need to purge a lot of documents at once, and regularly scheduled visits for those who need ongoing shredding services. Irvine businesses can sign up for ongoing shredding services on a daily, weekly, bi-weekly, monthly bi-monthly, or quarterly basis without having to worry about being locked into a long-term contract. Instead, we use a simple agreement form with straightforward language that confirms the frequency of our on-site shredding visits; the rate of our service; the use of our security containers for the duration of the agreement; and the need for 30 days’ advance notice if you need to end our services. Our ongoing, scheduled shredding services are designed to be very flexible, so they can readily meet the varied and sometimes unpredictable needs of our valued clients in Irvine. Call today for a free quote on our on-site/mobile shredding services in Irvine. When clients in Irvine sign up for our regularly scheduled, ongoing shredding services, we will also provide them with as many shredding containers as they need. We carry rolling bins that are 40″ tall and 23″ wide by 29″ deep, and stationary consoles that are 35″ tall and 19″ by 19″. Both of these containers are lockable, so you can store your confidential documents securely until they are scheduled to be shredded. These secure bins and consoles meet current privacy law requirements, including those set by HIPAA, GLBA, and FACTA, and also make it easy for your employees to comply with these laws when they are strategically placed in areas where they produce and discard the most paper. The shredding itself is performed with state-of-the-art shred trucks. Our shred trucks can go on most roads, shred up to 6,000 pounds of paper per hour, carry up to 7,000 pounds, and automatically lift and feed our containers into its fully-enclosed shredding area. Irvine clients can watch the truck as it lifts each shred bin and view our onboard shred cam to see the paper entering into the shredder. Our trucks use a pierce and tear technique which is extremely effective in destroying paper items with minimal dust. 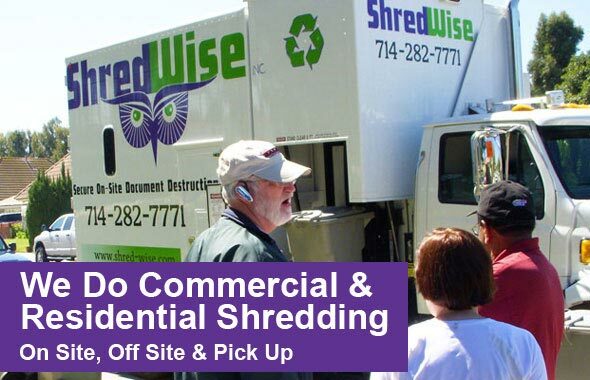 The team at Shred Wise is happy to provide quotes for our on-site or off-site shredding services over the phone or in person. Call today to learn more. Normal operating hours are from 7am to 5:30pm, Monday through Saturday, and from 8am to 12pm on Sundays.